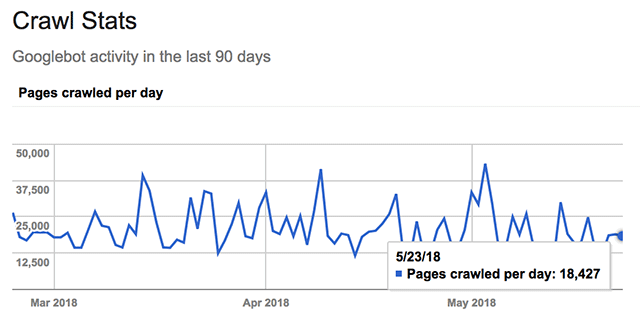 About a week ago, we told you about a bug with Google Search Console where the crawl stats were delayed a bit. Well, it is now 3 weeks, 21 days, since the crawl stats has been updated. Update: 10 minutes after I posted this, the data is now back and up to date. We have data up to yesterday now! Ignore everything else below, as this blog post originally stated everything is still delayed after 3 weeks! The last date you get is May 23, 2018 and nothing after. This is a bug, Google has confirmed they are working on fixing the report but for now, you need to wait it out. How much longer? We do not know, but John Mueller of Google said "it's been taking much longer than expected, but it'll be back," on Twitter. Sorry - it's been taking much longer than expected, but it'll be back.